Programme Fee – INR 1500 per module. Participants also have an option to register for all the six modules by paying INR 7500. Of the multidimensional tools offered by the system of Yoga towards holistic wellbeing, Āsana remains one that is widely sought after. While Āsana, is a means to a higher end, in today’s day and time, the proper practice of Āsana-s done with emphasis on appropriate techniques of breathing, can prove to be beneficial physically, physiologically and emotionally as well. 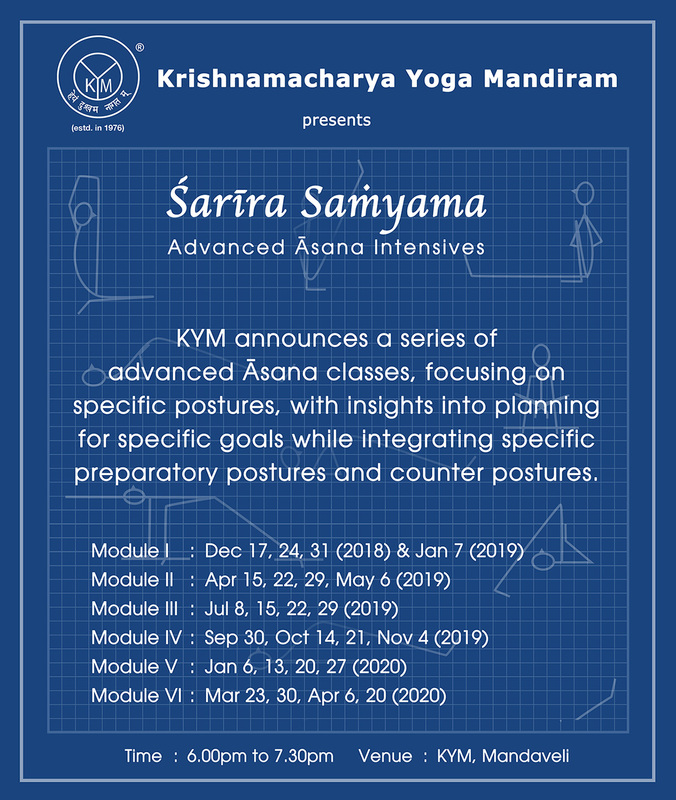 KYM is happy to announce a series of advanced Āsana classes, focusing on a specific posture, with insights into planning for specific goals while integrating specific preparatory postures and counter-postures. There will be a brief introduction to the form and function of each posture, as well as means to intensify the effects of the posture. This class offers an advanced study of Āsana and will be open only to those with prior experience in practicing Yoga in any tradition. Interested students will first meet one of the consultants of KYM for preliminary assessment before being offered a space in this programme. These classes will be led by Ms. Sangeetha Kannan, senior faculty, KYM Institute of Yoga Studies and Mr. Arul Perumal, Advanced Āsana faculty, KYM.